Deb Perelman. © Christine Han photography. Me and Deb Perelman go waaay back—largely because I am a long-time fan of her ultra-successful blog, Smitten Kitchen. When I was teaching myself how to cook in my mid-20s, Smitten Kitchen was a main reference point. A major draw—aside from her signature inventive fare—are her beautiful pictures visually detailing the steps of the cooking process. Cooking for dummies, you could call it, and I was one of those dummies desperate for a visual aid. Speaking as someone who much prefers to read cookbooks than novels, Perelman’s new recipe collection—Smitten Kitchen Every Day: Triumphant and Unfussy New Favorites —is one you can curl up with. I.Loved.This.Book. Besides the recipes, the stories drew me in, and not shockingly I especially enjoyed the breakfast and dessert sections—my favorite meals. 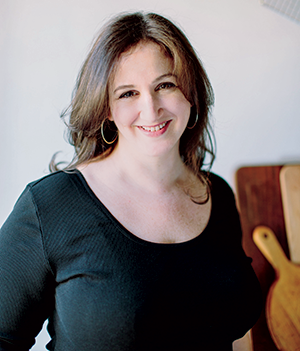 In this, her second cookbook, Perelman picks up where her first title—The Smitten Kitchen Cookbook —and blog leave off. She retains the voice and spirit of a true blogger, talking directly to her audience in her recipe introductions (see the perfect example below in her description of Chocolate Pecan Slag pecan pie). She can be hilarious—when was the last time you burst out laughing reading a cookbook?—and the way she incorporates her two children into her writing is charming and relatable. Her oftentimes self-deprecating prose feels like witty banter exchanged with a close friend. As for her recipes, they are a lesson in balancing decadence and mindfulness. Smitten Kitchen Everyday shows a more mature Perelman, where she satisfies her wanderlust and nostalgia through inventive fusions and scaled-back versions of gluttonous dishes. Thank you, Deb, for convincing us to make your winter squash flatbread and lightening up those stuffed potato skins. We will remember you when our jeans still fit. And yet there’s lots and lots of Parmesan cheese—You just can’t skimp on what makes you happy! Many of these new recipes you will undoubtedly add to your repertoire (hello, Wintry Apple Bake with Double Ginger Crumble), and much of the book is veggie friendly, including a whole section of both salads and non-meat mains. As for the title, Perelman claims to be a “lazy cook,” which comes across as cute if perhaps a little untrue. (After all, she does include a recipe for semifreddo and a few other creations that the average home cook might find intimidating.) But, true to the title, she does “un-fussify” cooking methods by breaking the recipes down into easy-to-follow steps and de-complicating processes that never needed to be complicated in the first place. Perelman’s emphasis on streamlining lie at the heart of this slab pie, in which she reimagines the hardest part of the pie making process—rolling pie crust. Considering how annoyed I get about fairly inconsequential stuff, such as decorative paper straws (mmm, wet paper fibers), single giant ice cubes in cocktails (that thwack you in the face when you take a sip), or a single granule of playground sandbox matter in my bed (always the bed; always the bed! ), I am sure someone finds it illogical that I find it difficult to get worked up about the evils of corn syrup. My gut feeling is that it shows up mostly in things that nobody is eating for underlying health benefits, and that we all understand we’re only supposed to enjoy in moderation (candies, caramels, etc. ); shouldn’t that be enough? 1. Toast your nuts! You must, you must. Untoasted pecans taste sweet but faintly waxy. Toasted pecans taste like toffeed pecan pie before they even hit the caramel. Just do it. 2. Dark-brown sugar trumps light-brown: more molasses, more flavor. By the same logic, both maple syrup and golden syrup taste better to me in pecan pie than corn syrup. The latter, a lightly cooked cane sugar syrup from the U.K. that is basically their maple syrup (i.e., beloved on pancakes), does contain a bit more sodium than corn syrup, however, so hold the salt back slightly if you’re using it. (I learned this the hard way.) I have also used honey in the past, but prefer using it for only half the volume of liquid sweetener here; otherwise, I find its flavor takes over. 3. A tiny bit of cider vinegar (trust me) really helps balance out the aching sweetness of a gooey caramel pie. 4. 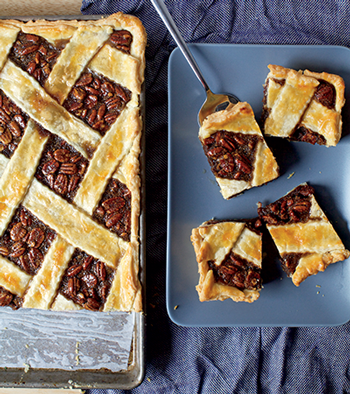 Good pecan pie causes a commotion, so you’re going to want to make a lot. Go slab or go home (and have to make more). 5. Finally, if you want to gild the lily (of course you do), add some chocolate. with a food processor: In the work bowl of a food processor, combine the flour, salt, and sugar. Add the butter, and pulse the machine until the mixture resembles a coarse meal and the largest bits of butter are the size of tiny peas. Turn the mixture out into a mixing bowl. both methods: Add the cold water, and stir with a spoon or flexible silicone spatula until large clumps form. Use your hands to knead the dough together a few times right in the bottom of the bowl. Divide the dough and wrap each half in a sheet of plastic wrap or waxed paper, and refrigerate until firm, at least 1 hour or up to 72 hours, or you can quick-firm this in the freezer for 15 minutes. If you plan to keep it longer than 3 days, it will have the best flavor if you freeze it until needed. Prepare the filling: Heat the oven to 375 degrees. Line the bottom of a 10-by-15-by-1-inch baking sheet or jelly-roll pan with parchment paper. Spread the pecans on a rimmed baking sheet and toast in the oven for 10 to 12 minutes, stirring once or twice so that they toast evenly. Set aside until needed. If you like smaller bits, you can chop some or all of the nuts to your desired size. Assemble the pie On a lightly floured surface, roll one of your dough halves (the larger one, if you have two different sizes) into an 18-by-13-inch rectangle. This can be kind of a pain, because it is so large. Do your best to work quickly, keeping the dough as cold as possible and using enough flour so it doesn’t stick to the counter. Transfer the dough to your prepared baking sheet, and gently drape some of the overhang in, so that the dough fills out the inner edges and corners. Some pastry will still hang over the sides of the pan; trim this to 1/2 inch. Freeze the piecrust in the pan until it is solid. Melt the chocolate chunks with the heavy cream, and stir until smooth. Spread over the bottom of the frozen crust. Freeze the crust again until the chocolate is solid, about another 10 minutes. In a large saucepan, combine the butter, brown sugar, maple or golden syrup, and salt. Bring to a simmer over medium heat, and cook for 2 minutes, stirring regularly. Remove the pan from the heat and stir in the pecans, cider vinegar, vanilla, and bourbon (if using). Pour into a bowl (so that it cools faster), and set the mixture aside to cool a little, 5 to 10 minutes. Then whisk in one egg at a time until combined. Pour the mixture into the prepared pie shell. Roll the second of your dough halves (the smaller one, if they were different sizes) into a 16-by-11-inch rectangle. You can drape it over in one piece (cutting slits to vent the top), or cut it into wide strips to form a lattice; pinch or crimp the upper and lower crusts together, and fold the bottom crust’s overhang, if you wish, over the top crust to seal it. (The lattice is always a bit of a mess, but no matter how much you hodgepodge it, people will freak out when they see it.) Lightly beat the egg with water, and brush this over the top crust and edges. Bake at 350 degrees until the crust is golden and the filling is bubbling, about 30 minutes. Transfer to a wire rack until just warm to the touch, about another 30 minutes, before cutting into squares. Excerpted from Smitten Kitchen Every Day: Triumphant and Unfussy New Favorites. Copyright © 2017 by Deb Perelman. All rights reserved. Bought this book because of this piece. I want to make a non-dairy version. Can the heavy cream be left out of the filling?